Children learn and express themselves through play. Educational toys can help them develop important abilities, discover who they are and find out what they like. 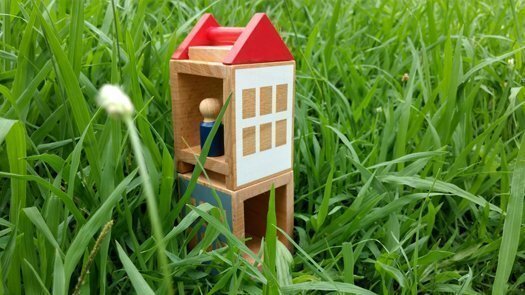 Our product ‘Lubu Town’ is a versatile toy system that combines construction with role play, encouraging the development of various abilities, such as of motor skills, problem solving, language development, social skills and imaginative play, just to mention a few. Treating the environment with respect is a central part of our company philosophy. We therefore make sure that our products as well as our production processes are safe, non-toxic and eco-friendly. Our toys are made of high-quality, natural beech wood and are produced entirely in Europe. Due to the short transport distances, manufacturing in Europe is far more sustainable than production in China where over 80% of the world’s toys are currently being made. Our toys are not divided into boys’ toys or girls’ toys, but are kept in a neutral design. Gender-based categorisation and marketing of toys can direct how and with what children play, which can affect their abilities, as typical boys’ toys tend to support the development of other skills than typical girls’ toys. We believe children should be able to choose how they want to structure their playtime and with which toys they wish to play, without being biased by gender stereotypes. Safety is one of our top priorities. We rigorously control the quality of our products and choose the materials we use with great care. Our toys are made of high quality beech wood and are treated with natural oils. We use water-based paints and formaldehyde-free glue that is specifically certified for children’s toys. All our toys meet or exceed general safety standards and are manufactured in compliance with the European Standard EN 71 (toy safety). At Lubulona we strive to make toys that enable children to shape their play time in an instinctive, natural and active way. That is why we start making prototypes quite early on in the design process of a new toy, which we then test in schools and kindergartens. Observing kids play helps us define successful features. We then adapt the prototypes accordingly until we have a toy that fully convinces us as well as them.